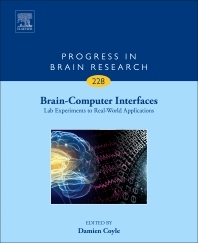 Brain-Computer Interfaces: Lab Experiments to Real-World Applications, the latest volume in the Progress in Brain Research series, focuses on new trends and developments. This established international series examines major areas of basic and clinical research within the neurosciences, as well as popular and emerging subfields. Damien Coyle is a Professor of Neurotechnology at the School of Computing and Intelligent Systems, Ulster University. He is developing neurotechnology to enable movement-free communication for the physically impaired. These developments are underpinned by research in computational intelligence, bio-signal processing, computational neuroscience, neuroimaging and brain-computer interface (BCI) applications. Damien is a Fellow of the UK Higher Education Academy, and teaches at both undergraduate and postgraduate level in computer science and engineering and supervises a number of PhD students and researchers. Damien studied at Ulster University, graduating as a Bachelor of Engineering in Electronics and Computing with first class honours in 2002 and with a PhD in intelligent signal processing for BCI applications in 2006. He joined the School as Lecturer (2006-2012), becoming Senior Lecturer (2012-2013), Reader (2013-2014) and Professor (2015). Previously an Ulster University Distinguished Research Fellow, Damien has won international research awards including the 2008 IEEE Computational Intelligence Society (CIS) Outstanding Doctoral Dissertation Award and the 2011 International Neural Network Society (INNS) Young Investigator of the Year Award. His research was shortlisted for the 2015 Annual International BCI Research Award. He was a Royal Academy of Engineering/The Leverhulme Trust Senior Research Fellow in 2013 and is currently a Royal Academy of Engineering Enterprise Fellow 2016. Damien is a founding member of the International BCI Society, a Senior member of the IEEE and chairs the IEEE Computational Intelligence Society (CIS) (UKRI chapter) which was awarded best and outstanding chapter awards from the IEEE region 8 and the IEEE CIS in 2012 and 2013, respectively.